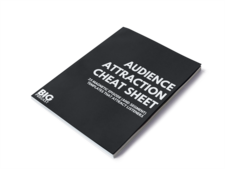 Get my free Audience Attraction "Cheat Sheet" with 25 podcast episode templates here. Remember when this podcast was called Big Podcast Daily? If so, you may have heard this episode where I talk about a "3-Part Podcast Series." Want an example of what this actually looks like? Listen to this. Don't Let Your Podcast Be Ignored - Download my free "Audience Attraction Cheat Sheet" to get 25 podcast episode (and segment) templates. Build A Big Podcast is the marketing podcast for podcasters! How to grow your podcast audience, better connect with listeners, and spread your message through podcasting with podcast marketing tips from David Hooper of RED Podcast.